The FTEF (Fort Thomas Education Foundation) conducted their annual Grant Patrol Thursday, April 21 – Monday April 26. This fun tradition gives the FTEF the opportunity to surprise FTIS teachers who have submitted an FTEF Grant Request with the news that their request has been funded. 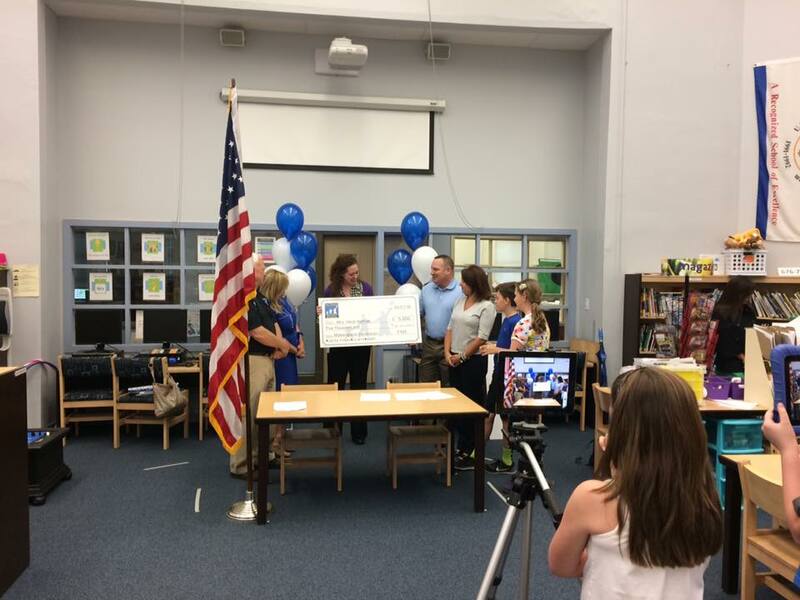 This year marks the largest amount of teacher grants awarded by the FTEF allowing them to deliver nearly all of the requested items. 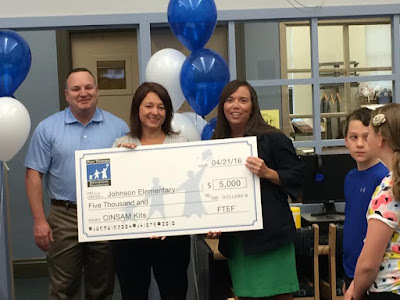 • Johnson, Moyer & Woodfill Elementary Schools –expanding the partnership with NKU and Center for Integrated Science and Mathematics (CINSAM) kits. “We are excited to order the new equipment and use this in the classroom for the 2016-17 school year. It is a pleasure and blessing to be part of a wonderful and supporting community. I look forward in teaching engineering principles and giving our students the best opportunity to learn new things in the engineering field,” Ron Rosel, teacher of Engineering & Technology at HHS. “This has been a great year for the FTEF. Being able to fund teacher grant requests is the cornerstone of our work. This year, we were able to fully or partially fund all of the requests because of the generosity of our community. A big thank you to anyone who gave to the FTEF this year with donations and volunteer time, this year would not have been so successful without your support. Seeing our teachers and students excited about the opportunities available because of the granted items is what it’s all about. We can’t wait to see them in action during the 2016-17 school year!” Amy Shaffer, FTEF Board President. 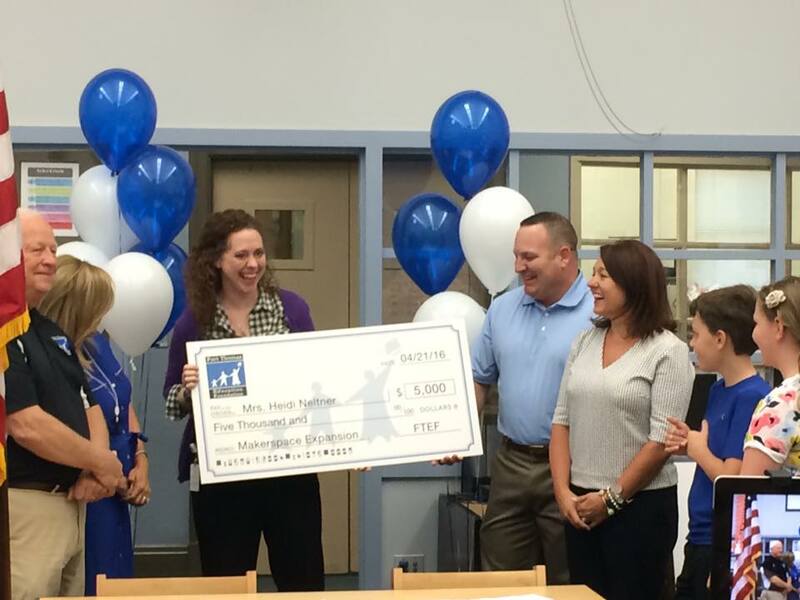 “There is no way we could ever thank the Fort Thomas Education Foundation enough for their hard work and generosity! They have given our kids some of the tools and support they need to dream big!” Heidi Neltner, Johnson Elementary Library Media Specialist. Any teacher or administrator of the FTIS is encouraged to submit grant requests to the FTEF during the annual grant review process. Grants are awarded in the spring by the FTEF Grants Patrol where teachers and students are surprised in their classrooms with balloons and a big check. The FTEF is a non-profit organization that raises money to improve Fort Thomas public schools and student resources because we’re serious about educational excellence. Since 2000 the FTEF has been able to give back over $11 million to FTIS schools due to contributions from over 1,800 donors.